Please download the registration forms, linked below, and mail or email to the Riley School with your non-refundable $50 deposit. We accept PayPal or check. To sign up for Riley Nights: Community Talent Show, fill out the Google Form below. Cost: Full week only: $225/week After-care $25/week. Description: The Riley School is offering full week-long camps during February and April school vacations. RILEY DAYS Vacation Camp will be a fun-filled week of both indoor and outdoor exploration for children ages 5-12. Children will have the option to participate in a variety of activities such as: drama games, skit-making, storytelling, movement, music, pyramids, tumbling, field games, legos, art projects, gardening, fort building, and exploring the natural world. The theater will be our indoor playground where children will have use of the stage, to perform for each other, and for those that are interested, to create acts for our RILEY NIGHTS: Community Talent Show on Friday, April 19 at 6:00pm. Those who don't want to perform in the show can help with costumes, props and other aspects of community show-building. Description: At Riley Days Summer Camp, children explore their world through play and creative arts on Riley’s beautiful 20-acre campus. Children will sample a variety of fun activities both outdoors and inside Riley’s theater. 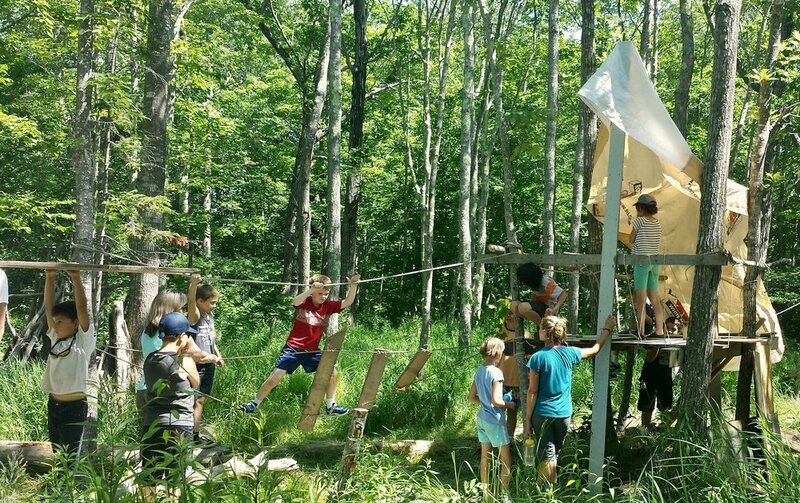 Children will be introduced to: drama, movement, music, skit creation, art projects, set building, costuming and plenty of outdoor games, gardening and exploration of the campus and cove. Each weekly session will be an adventure as campers collaborate on choosing a theme for projects and possibly creating a show to share their new-found skills and talents. Children will explore their creativity and learn how to work together, in a welcoming and supportive environment. Description: Imagine a place where children of all ages can go, to share their performing talents with the community on a regular basis! Many children don’t have opportunities to be on stage, or would like to be on stage more often. RILEY NIGHTS will be hosting monthly Friday evening talent shows, open to the public for a nominal fee. We would like to encourage anyone who has already participated to join us again, and any new faces to brave the initial skepticism of a talent show and join us on the Riley stage! Really there is nothing to lose; it is non-competitive show and acts rage from fully polished performances to works in progress or improvisation. We are looking for music, dancing, skits, acting, poetry, puppet shows, tricycle riding, really anything you can think of! Cost: Suggested donation of $5. Proceeds go to the Riley Vacation Camps Scholarship Fund.